. 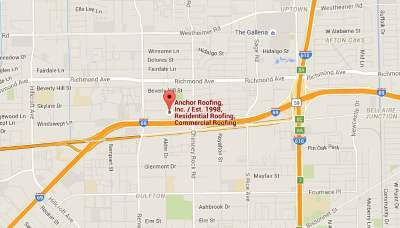 Re-Roof | Roof Replacement Companies in Houston Texas | Anchor Roofing Inc.
Should your replace your roof or install a new one? Installing a new roofing system on your property is not a small project. Hiring a right roofing contractor to complete the project and ensure that the finished result perform and looks up to expectations will leave you satisfied. The Vital first step is to determine who will you include helping you make all decisions in the process. It is possible that job titles may vary with every different project, but the key to successfully finishing a roofing project lies in two groups of individuals. One of those individuals should be contractor that is already familiar with the current roofing system, repairs and solutions that have already been utilized and any current problem that is ongoing with that particular roofing system. You should also be involved in the project from start to finish as a person who will have final saying during the roof installation project when it comes to budget and the amount of money that should be spent. If your roofing system is being installed from a scratch, the construction project might require the inclusion of designer or an architect. Bringing them early on the project will decrease chances of error, and it will ensure you that all issues are taken care of up-front. And the main thing you should look for is the trusted, experienced and skilled roofing contractor. You should interview your contractor before you make decission. Most important thing is to find out how much experience does your roofing contractor have with this particular roofing system. Before you start a roof replacement project, the contractor needs to conduct a thorough inspection and investigation of the current roofing system. That is the only way to find out what problems are present with your existing roof. You should also talk to your roofing contractor to set the schedule for work if there are times during the day when noise may become the problem for your neighbors. Also, stay in contact with the manufacturer of the roofing product and find out for how long your roofing material will have the manufacturers warranty. When it comes to installing a new roof, most home and business owners have the price tag on top of their minds. However, there will also be other expenses during the roofing project. Another thing to think about is warranty. Warranty usually plays the vital role in the final price of the roofing system. What does your warranty include? What does it cover? What does it exclude? Some warranties might even cover interior damage caused by a leaking roofing system while others might not. You should also fing out how much will it cost you to inspect regularly and maintain your new roof and what is expected a lifespan of that particular roofing system. The price of a roofing system will be lower the longer it lasts and the less it requires and costs to maintain so contact your best Houston roofing contractor today and schedule a meeting.